Kestrel Foods has launched Acti-Snack, an innovative range of healthy mixed fruit, nut and seed snacks, in the UK and Ireland. The range comprises five unique mixes, ‘Sweet & Sour Mango’, ‘Fruit, Nut & Seed’, ‘Fruit & Nut’, ‘Fruit, Nut & Soya’ and ‘Nut Mix’, all of which are gluten free, free from artificial additives and preservatives and designed to meet a variety of sports nutrition requirements. 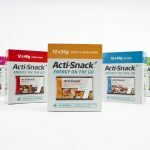 A totally unique product in the sports nutrition category, Acti-Snack has been developed using Kestrel Foods’ vast experience to deliver an ‘energy on the go’ snacking solution combining health, nutrition and taste.